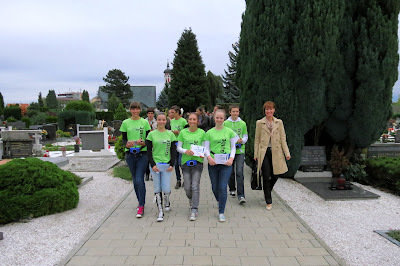 This year, 6 children from Maribor elementary schools guided the ASCE members through Pobrežje cemetery. An experience, very different for the visitors, scholars and the schools. It all started at Pobrežje cemetery in April, when Pogrebno podjetje Maribor (cemetery management company) hosted scholars from 2 schools for the cultural day. Scholars were presented with the history of the cemetery and important people burried there. With an excellent prepared guidance, scholars immediately became aware that cemetery is not just a place of death and sadness. It was a place of many interesting findings and as they have learned about the important people in the cemetery, scholars were actually learning about themselves and their own history. For many of them, the experience was so impressive, that they have volunteered for becoming the guides by themselves. Preparations started and soon, they were guiding their first visitors, during the Week of Discovering European Cemeteries (WDEC). After the first experience, our youngest guides worked with their english teachers and improved the guidance techniques and knowledge for their big challenge: guiding the ASCE members and partners through the cemetery at AGM 2012. As it turned out, they were surprisingly relaxed, practical and interesting. 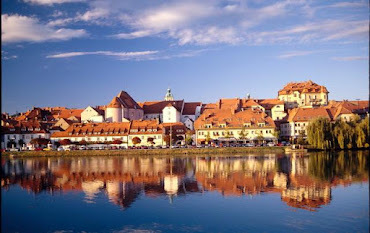 Present members enjoyed the easy guidance where scholars presented the most important people of Maribor with just enough facts and interesting stories. The project has many important implications and presents one of the best possible ways to get every European citizen in touch with the heritage, preserved in the cemeteries. Because scholars are not the only ones impressed. Their families, friends and many others are now learning from them about the importance of our cemeteries.